Known for his aesthetic, energetic and creative approach Akshay Anantapadmanabhan’s music is about honestly conveying ideas, moods and emotions in solo, collaborative and accompaniment spaces. 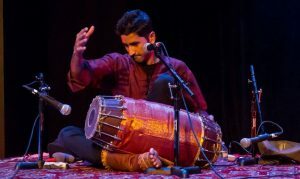 His sensitive style and unique backgrounds molded from the eclectic artistic cultures of Chennai and New York City are quickly paving his path as one of the top mridangam artists in his generation. Read below about Akshay’s favorite Fellowship productions and why he enjoyed working on them. Do check out Akshay’s Website, Facebook Page, YouTube Channel and Tour information page to learn more about Akshay and his music! Inside the Austin DIY Raga Labs!